I was so excited that in our 2009/2010 Idea Book and Catalogue we've got individual markers for the four main colour families. But of course due to the limited time frame for the in colours we haven't got markers in those colours. Other demonstrators have been talking about using In Colour reinkers and blender pens to create In Colour so I thought I'd give it a go. I got out a brand new blender pen and two in colour reinkers - Riding Hood Red and Pink Pirouette. I found the best way to remove the foam tip from the blender pen after trying tweezers with just a sharp tug holding it between my thumb and finger. 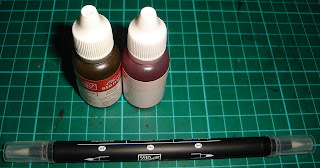 Use the reinker bottle to slowly drip ink into one end of the blender pen. Use some scrap paper or even better a paper towel to catch any residue, this is a messy process. I then inked the other end with Pink Pirouette and a slightly used blender pen with Pacific point and Kiwi Kiss. 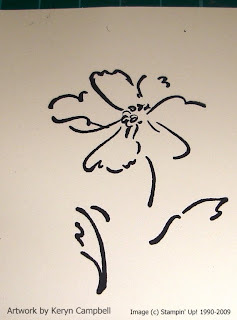 Of course I had to try them out so I stamped the outline flower image from 'Heartfelt Thanks' using Black Stazone ink. If you clean this immediately using the Stampin' Scrub and Stampin' Mist you will be able to clean the stamp. Leave it any longer and it will stain. This is my coloured flower. - Using a used blender pen with a well functioning nib works better, more room for the ink. 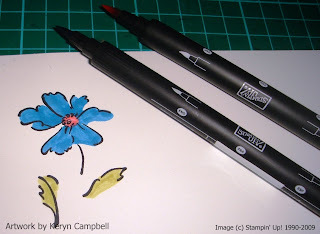 - The blender pen markers seem wetter than the Stampin' Write Markers. - Pink Pirouette is really too light when mixed with the remaining blender fluid. - I'm going to store these markers away from my blender pens. It could be very easy to have a nasty colouring accident if they got confused.